Today was our final full day in Helsinki. We had no big tourist attractions left to visit. Lisa wanted to do some shopping, and she also was looking for us to track down a transportation oddity that she wanted to see. 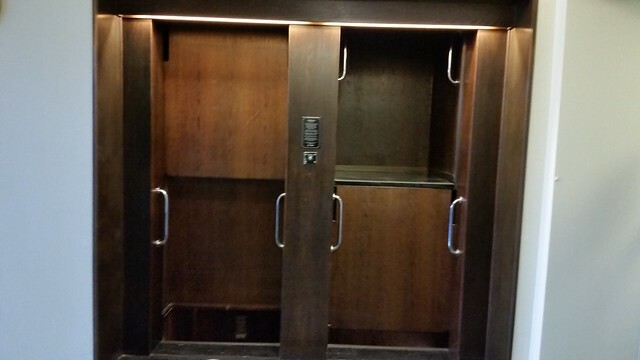 This is a 'paternoster' elevator. Instead of being a single car that comes when you call it and goes where you tell it, a paternoster consists of a series of cars running on a continuous loop. When a car comes by, you step into it and ride it to your floor, then step off. It doesn't stop. It's up to you to step in and out of the thing without getting trapped and breaking your leg or something like that. I'm astounded that these things are still allowed to operate, actually. They look rather dangerous. But OTOH, I'm glad I got a chance to ride one of them — once. After our Adventure in Elevators, we had a "target of opportunity," in the form of a train hobby shop just a couple of doors down from the first stop. Lisa had a look through the store but did not find anything that caught her fancy. Next was a search for an electronics store to which she had been referred in search of a particular kind of power outlet that the hardware store didn't know about. That turned out to be fruitless as well, but it was interesting to walk around and see new places. As we were riding the #7 toward that electronics store, Lisa spotted a small appliance store and we rode back up the line to continue her search for an electric kettle not Made in China. This time, we succeeded! This Braun kettle is made in the Czech Republic. Lisa bought it. Yes, we know about the voltage and plug differences. Rather than use a plug converter/transformer, Lisa intends to wire a European 220V outlet, branched off the circuit she laid to the water heater, to power this in our kitchen. The water heater is on a 50A line, but only 30A goes to the water heater, so that 16A required for this kettle shouldn't overdraw the circuit. 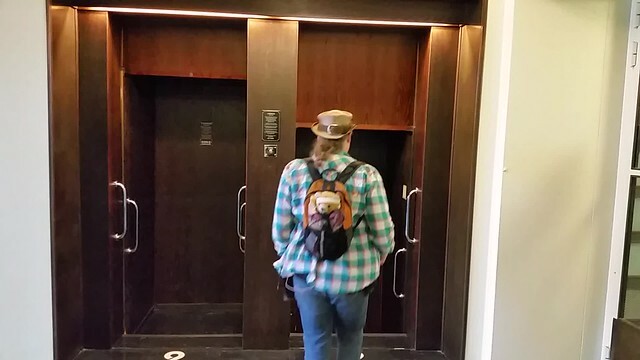 There are still a handful of Worldcon attendees staying in the Holiday Inn, and we saw a few of them in the lobby when we headed out this morning. 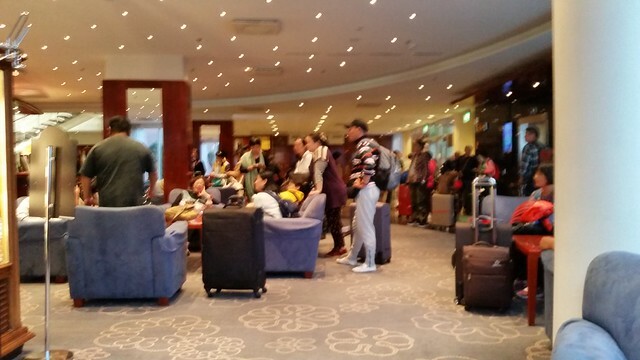 However, now the hotel is mostly full of Chinese tour groups. Periodically, as each busload arrived, the lobby would fill with people checking in. This of course led to a traffic jam as they all tried to get up the elevators at once, and had to learn that to get beyond the 2nd floor, you have to insert your room key. 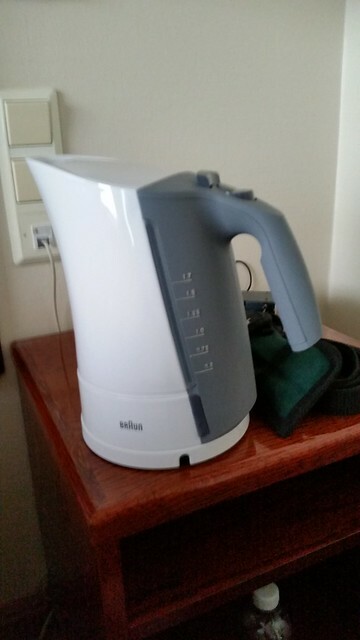 We had to go back to the hotel to put away Lisa's newly-acquired kettle, which actually does fit in her luggage. (She says she can make it fit by putting some of her clothing inside the kettle, so the total additional cube doesn't increase that much.) That led to our final meal excursion of the trip, but that's another story.